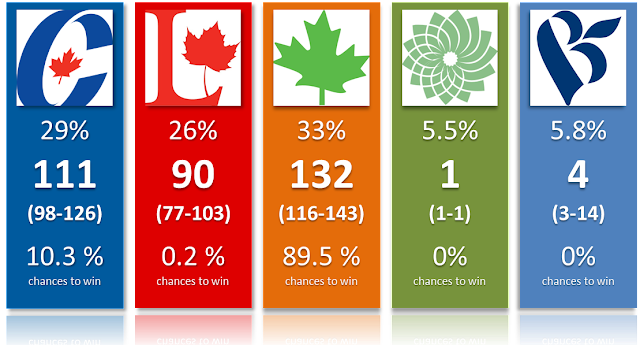 The NDP continues to dominate the federal voting intentions as well as my seat projections. It has now lasted for a while, so I think it's safe to say the NDP bump isn't simply a momentary thing. It doesn't mean it will last until the next October of course. Using the four polls published this month (one Ekos, two Forum and one Abacus), the NDP is ahead of the Conservatives while the Liberals trail as third. If the election was tomorrow, the NDP would clearly be favorite. I've seen other sites pretending it's a 50-50 race at the moment but this is nonsense. The only way you get a 50-50 race is if you take 2 points away from the NDP and give them to the CPC in every single province. While I do think the CPC could be underestimated by the polls and I fully intend on accounting for this during the election, we are still in a situation where the NDP can actually afford the luxury of being overestimated in the polls and still win! The detailed, riding by riding projections can be found here. Right now, the NDP clearly dominates in Quebec (with a lesser margin than in 2011 but still sufficient to win the most seats by far) as well as BC. Ontario is really the last major province still fighting Thomas Mulcair. It's a close three way race as far as the votes are concerned, but the seats simply aren't there for the NDP. It's an improvement over 2011 for sure, but the seat share is still below the vote share. Without a breakthrough in Canada's largest province, it's hard to imagine a path to a majority for the New Democrats. At the same time, and as has been the case for a while, no party is in a position to get 169 seats or more. I realize the election is still a long time away and things can change. However, while my probabilities aren't meant to measure the uncertainty over time (it's there to account for the uncertainty of the polls as well as of the electoral system), we can kinda use them for such an interpretation. At the very least, it does give us an idea of the uncertainty that exists. Specifically, the simulations do put each party above and below their current average. For the NDP, it means that some simulations have this party as low as 27% for instance. 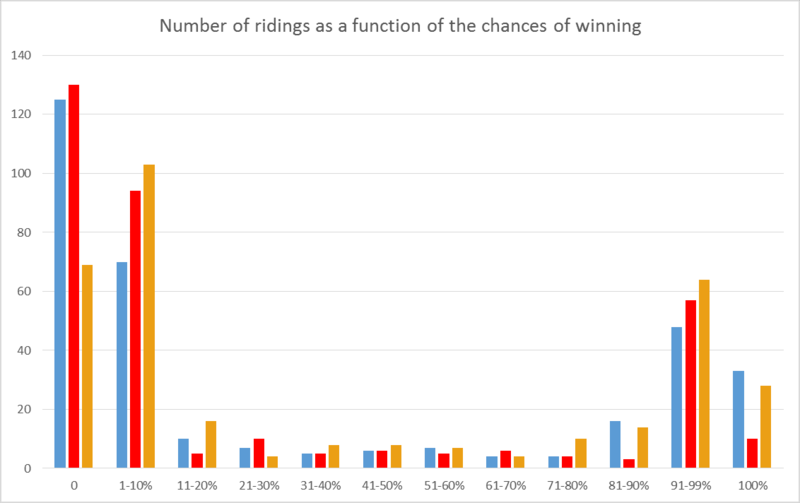 Moreover, if we look at the riding level, we can see how many seats are currently safe for each party. The graph below shows, for each party, how many ridings currently fall in each probability category. For instance, the 1-10% bin shows the number of ridings where one party has between 1 and 10% chances of winning. The NDP has 28 ridings with absolute certainty of winning (again, if the election was tomorrow). It doesn't mean these districts won't elect a MP from a different party in October, but it'll take major changes for this to happen. As a reminder, the model has not made a mistake yet in the ridings with 100% (and 0%) probabilities. The CPC has 33 and the Liberals only 10. While the Tories have the highest number of safe seats, the NDP ultimately would win here thanks to a much higher number of very likely ridings (at 90% and plus). Notice also that the Liberals are the party with the highest number of ridings with no chance at all. 130 ridings are in this situation for Trudeau. It's 125 for Harper and his party and only 69 for the NDP. Thus, the NDP is currently the party that is truly in the race everywhere. Sure, their MPs would mostly come from Quebec and BC, but it'd wrong to say the NDP has a very regionalised support. If anything, it's because its support is so widespread that the NDP isn't winning more seats. Again, the vote efficiency in Ontario for instance just isn't there. At the end of the day, the current poll average clearly shows that the NDP is ahead. Quebec and BC would both provide a significant number of seats to Thomas Mulcair. The key now for him is to find a way to become the second or first party in Ontario. Make no mistake however, the Conservatives are still in this race and it wouldn't take much for Harper to win another time (with a minority though). As for Trudeau, the situation doesn't seem to improve but it's also not getting worse. Chances of winning the most seats are low but they aren't zero either. Moving from 3rd to 1st is never easy though as you necessarily need to leapfrog two parties.